Another one of my favorite, super easy chicken dinner recipes is this delicious Lemon Artichoke Chicken dish. The seasoning are soon tasty, and the chicken comes out perfectly juicy and tender. At just 5 Points per serving, you get a delicious entree that offers a nice amount of protein and fiber with barely any carbs. Also, note that the recipe only calls for a tsp of saffron threads, but my photo may show more. I tend to get a little heavy handed with the saffron because I adore it, but feel free to use as much or as little of the saffron as you want. This dish works really nicely over orzo pasta or brown rice, and I like to serve it with a simple side salad for a complete meal. Enjoy! 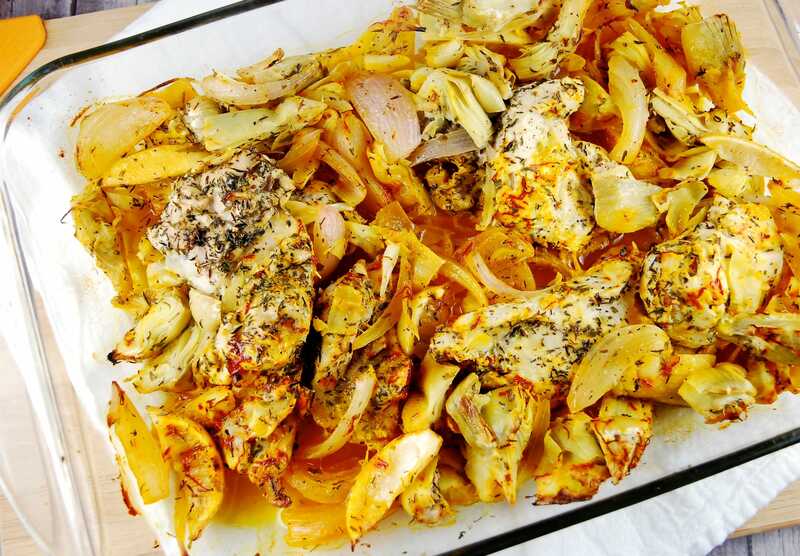 Moist, juicy chicken thighs decadently seasoned and served over tender roasted artichoke hearts. This dish hits a ton of flavor notes yet it’s such a breeze to prepare. Combine all ingredients in a large bowl, and toss well with hands to coat. Cover and let marinade for at least 2-3 hours. Preheat oven to 425 and spray a large baking dish with nonfat cooking spray. Place chicken and artichoke mixture into baking dish, and roast uncovered for about 30 minutes. Then cover with foil, and roast for another 15 minutes. Let cool 5 minutes before serving. I have a question about servings and calories. The recipe says it makes both 4 servings and 8 servings and the calories are listed as 195 (for the 8 servings) and 103 (for the 4 servings). Can you please clarify? Thank you!